Naples, Fla. - Home buyers had many more options to choose from in February as housing market inventory increased 7 percent to 7,442 homes in February 2019 compared to 6,912 in February 2018. In addition to 1,498 new listings added to the Southwest Florida MLS in February, the February 2019 Market Report released by the Naples Area Board of REALTORS® (NABOR®), which tracks home listings and sales within Collier County (excluding Marco Island), also reflected a 4 percent decrease in the overall median closed price to $335,000 in February 2019 compared to $350,000 in February 2018. "This is typically the time of year when we see inventory jump," said W. Kunkle, President and Managing Broker at Kunkle International Realty. "New listings increased 34 percent in the single-family home market and 7 percent in the condominium market [based on a comparison of February statistics]. That's a lot of great new options for buyers!" While there were 100 fewer closed sales in February 2019 compared to closed sales in February 2018 (a 14 percent decrease), the added inventory has broker analysts like D. Pallini, Broker at Vanderbilt Realty, convinced that buyers are not rushing into a sale like many did when inventory levels were much lower; and instead, are meticulously evaluating all their options that include new and existing homes. "The average days on the market increased in February, which tells me that buyers are looking at more homes before they make an offer," said Pallini. "Plus, there is a lot more new construction this year than a year ago. Agents were rarely in the office in February because showings really increased dramatically." Unlike many Florida markets, sales of homes in Naples are very geographically influenced. Historically, the closer a property was to the beach, the faster it would sell. But that's not always the case anymore. Days on market were the lowest in the South Naples area (34112, 34113) in February; yet prices for single-family homes in this geographic area decreased 25 percent to $420,000 in February 2019 from $560,000 in February 2018. "Our statistics show that the closed prices of properties that were sold in February averaged 95 to 96 percent of the current list price," B. Fioretti, Managing Broker at Berkshire Hathaway HomeServices Florida Realty. "This shows that once a property is priced to attract buyers, the seller can realize a final closing price within 4 to 5 percent of asking price." Fioretti added that "many of the current listed properties are priced in excess of the range that is attracting buyers so sellers often have to reduce their asking price to the point where buyers are interested, looking and ready to make an offer. Pricing a home appropriately from the start helps the seller realize a much shorter marketing time and makes for a smoother transaction." P. Wood, President & CEO of John R. Wood Properties, added that REALTORS® help buyers find the right homes at the right price in the right area faster because they understand how each geographic area and the neighborhoods within them are different. "For example, closed sales of single-family homes near the beach decreased in February compared to a year ago while its median closed price increased; but closed sales of single-family homes increased in the South Naples area during February and its median closed price fell." "The high-end market continues to do very well in our area," said M. Hughes, Vice President and General Manager for Downing-Frye Realty, Inc., who added that those high-end sales are usually made by very astute buyers and if the economy was bad or on a path to becoming bad, then they wouldn't be buying as they are currently. "You can't look at our market with only one lens," Hughes added. "A lot can change in a quarter mile. Sellers are best served when they work with a REALTOR®, whose job is to offer home buyers and sellers a good understanding of neighborhood market trends and comparative pricing strategies. This is very important during high season, and especially today, when buyers have more housing options." When you are ready to put your home on the market, contact Jeremy O'Guinn for the experience, negotiating skills, and local knowledge you need to ensure your experience is a success. Check out his booklet, Preparing Your Home for a Successful Sale. Even though the Southwest Florida MLS system is not as widely used by REALTORS® working in commercial real estate in Naples, the data collected does help agents gauge this sector of the market. According to W. Kunkle, President and Managing Broker at Kunkle International Realty, “Vacancy rates for commercial properties are low right now. I’m seeing most vacancy rates well under 5 percent.” Historically, commercial real estate activity is directly affected by the residential real estate market. When nearly 1,000 more homes are sold annually compared to a previous year, as was the case between 2017 and 2018, it is realistic to expect the number of businesses will increase to meet the needs of those new consumers. Dozens of new commercial properties are in various stages of development across Collier County, many of which have large grocery store anchors. Naples, Fla. (December 21, 2018) - Home sales in November increased by double digits across every price category resulting in an overall increase of 24 percent compared to November 2017. Median closed prices decreased for homes under $1 million in November and inventory rose 12 percent to 5,971 homes, according to the November 2018 Market Report released by the Naples Area Board of REALTORS® (NABOR®), which tracks home listings and sales within Collier County (excluding Marco Island). "The November report shows greater balance in the market which is propelling strong performance," said B. Huskey, President, Premier Sotheby's International Realty, who added that the 24 percent increase in overall closed sales for November is "significant because it reflects our recovery from the hurricane last year." The $0 to $300,000 single-family home market had the most impressive activity in November where inventory rose 38 percent and closed sales increased 30 percent compared to November 2017. This section of the market also saw its median closed price hold steady at $250,000. "New home construction in the lower price tiers is rushing to meet the needs of buyers and it's building our inventory in much needed areas within eastern Collier," said M. Hughes, Vice President and General Manager for Downing-Frye Realty, Inc. The November market report supports Hughes' claim as the East Naples area (34114, 34117, 34120 and 34137) saw the highest number of closed sales for single-family homes - 105 - with another 121 sales pending. According to C. Carroll, SRA, of Carroll & Carroll Appraisers & Consultants, LLC, activity in the $0 to $300,000 price category is rallying in Collier. "Inventory under $300,000 consumes over half of the available condominium inventory. It had the highest inventory increase [38 percent] in the single-family home market too. The November report shows our inventory levels are just about even between condos and single-family homes now." "We haven't seen this level of inventory going into season in six years," said NABOR® President J. Jones, Managing Broker for Engel & VölkersNaples and Bonita Springs offices. "Plus, days on market is cascading downward which is a sign of better pricing. The trend to price homes to sell is clearly taking hold and it's definitely making a difference in overall sales numbers. Visitors will be impressed at the choices and stable prices this season." Broken down geographically, Collier's housing market in November had some interesting pockets of activity. For example, median closed prices decreased 19 percent in the Naples Beach area (34102, 34103, 34108); but increased 12 percent in the North Naples area (34109, 34110, 34119). There was a 90 percent increase in closed sales of condominiums in East Naples (34114, 34117, 34120, 34137), which brokers attribute to an increase in new construction of townhome developments east of Collier Boulevard. And single-family homes in Central Naples (34104, 34105, 34116) sold the fastest with an average 66 days on the market from listing to closing. Naples, FL - Closed sales of homes in the Naples market grew 20 percent to 674 sales in October 2018 compared to 561 sales in October 2017. The last few months have seen not only a return to a steady housing market for Naples since Hurricane Irma, but also an increased buyer appetite for homes in Collier County. 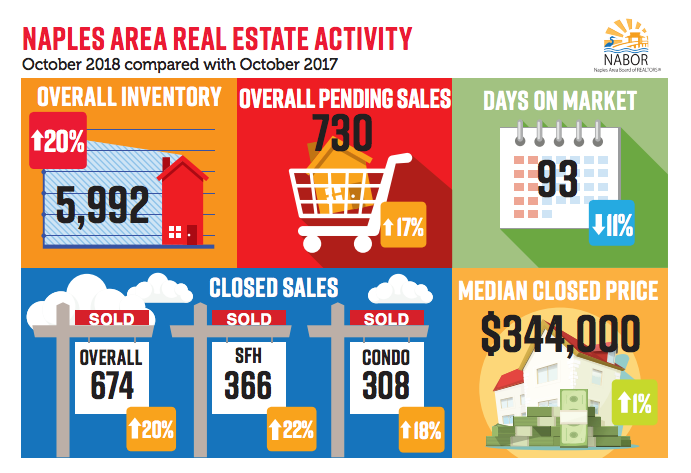 We are pleased to report that inventory during October jumped 20 percent to 5,992 homes - the highest October inventory level since 2012 - which is good news for buyers according to leading broker analysts who reviewed the October 2018 Market Report released by the Naples Area Board of REALTORS® (NABOR®), which tracks home listings and sales within Collier County (excluding Marco Island). While buyers struggle to find inventory in other highly desirable locations across the country, this is not the case in Naples. "We have almost 7.5 months of inventory," said Bill C. "In fact, inventory for single-family homes under $300,000 grew by 79 percent to 483 homes in October!" Cindy Carroll, SRA, of Carroll & Carroll Appraisers & Consultants, LLC, believes the spike in inventory during October is a reflection of the market's recovery after Hurricane Irma in September 2017. "There are some neighborhoods where I still see an oversupply in the spec home market, but I'm also seeing inventory begin to tighten in very desirable areas west of U.S. 41." Historically, inventory begins to increase in October in preparation of seasonal visitors entering Naples' prime home-selling season. According to Jeff J., "About 10 percent of the new inventory in our MLS during October was new construction. A good portion of this building is taking place in East Naples [Eastern Collier County], which had the highest single-family home inventory reported in October. Builders also tell me that over 80 percent of their inventory is sold by REALTORS® rather than the builders' sales staff." Overall pending sales for October were up 17 percent with the $1 to $2 million price category reporting the highest increase (39 percent) for the month compared to October 2017. The October report also showed the overall median closed price increased 1 percent to $344,000 from $342,000 in October 2017; but went down 1 percent for homes priced over $300,000 to $475,000 from $480,000 in October 2017. Interestingly, the median closed price in the Naples Beach area decreased 13 percent in October to $595,000 in October 2018 from $682,000 in October 2017. However, in the 12-months ending October 2018, the median closed price rose 4 percent to $344,000 from $330,000 in the 12-months ending October 2017. In the Naples Beach area, the median price rose 4 percent in the 12-months ending October 2018 to $790,000 from $763,000 in 12 months-ending October 2017. Added Carroll, "In addition to predictions that our inventory will continue to increase as we approach the winter season, giving home buyers more choices, we also saw the passing of Amendment 2, which put a permanent cap of 10 percent on annual non-homestead property assessment increase, keeping a reasonable protection for home owners in place. Along with a trend for home sellers to price properties realistically, these factors should inspire even more buyers of second-home properties in the coming months to make their purchase decision this season while all these factors work in their favor." Increased inventory is expected to lead to increased sales. Higher volume sales during our peak selling months during season is important for both homebuyers and sellers. For home buyers, it means a higher likelihood of finding the right property. For home sellers, it means shorter marketing time and a higher likelihood of finding a buyer. Naples, Fla. - One year after Hurricane Irma, overall closed sales in Naples increased 62 percent to 644 homes in September of 2018 compared to 398 closed sales of homes in September of 2017. According to broker analysts, this impressive increase in month over month sales is a result of the effect of the hurricane when homes sales halted following the massive storm. "The September Market Report shows how resilient and desirable our market is," said Lauren M. "A three percent increase in pending and closed sales, year over year, is strong considering the reduced sales activity during the troubled period following the hurricane. This was when many sellers were making repairs caused by the hurricane. The September statistics show that our market is in a good position to see positive activity for the fourth quarter." "Luxury properties are driving the market in the third quarter," remarked Coco A. "Third quarter pending sales in the $1 million to $2 million price category are up 18 percent and in the $2 million+ category they are up 50 percent compared to the pending sales in the third quarter of 2017." "Even though the overall median closed price for the 12-months ending September 2018 increased 5 percent to $344,000 from $329,000, median closed prices for homes below $1 million saw no change in price, compared to 12-months ending September 2017," said Brenda F. "In fact, only homes priced between $1 million and $2 million in the 12-months ending September 2018 saw an increase, which was 3 percent to $1,375,000 from $1,340,000. The median closed prices for homes over $2 million decreased 4 percent year over year to $2,991,00 from $3,100,000." 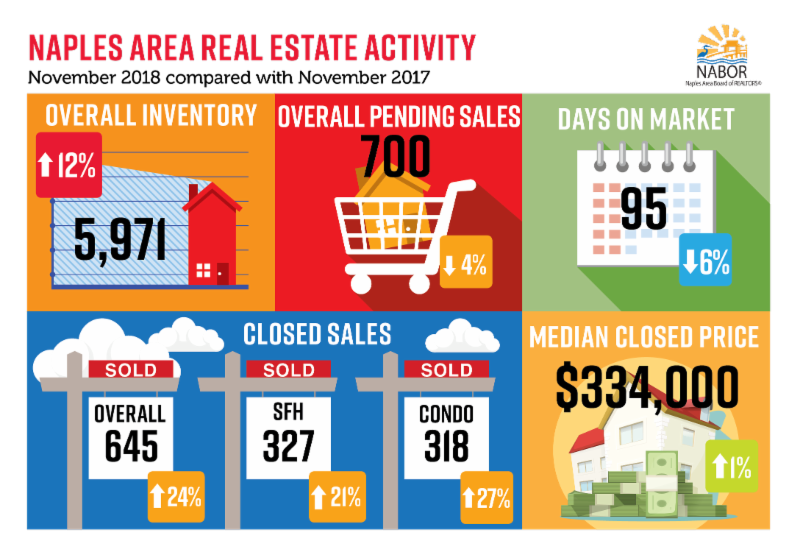 According to Jeff J., "Sales activity in East Naples was impressive during the third quarter. This geographic area saw an increase of 21 percent in its closed sales and an increase of 16 percent in its inventory compared to the third quarter of 2017!" When you are ready to put your home on the market, contact Jeremy O'Guinn for the experience, negotiating skills, and local knowledge you need to ensure your experience is a success. Naples, Fla. - Sales of homes above $1 million in Naples during the first quarter of 2018 drove the market. Their sales increased 61 percent compared to the same quarter of 2017 according to the First Quarter 2018 Market Report released by the Naples Area Board of REALTORS® (NABOR®), which tracks home listings and sales within Collier County (excluding Marco Island). "January's results led some to question expectations for the year when compared to last, yet in February the market gained its stride which accelerated in March with closed sales shooting ahead to end the first quarter on a very impressive note," said B. Huskey. 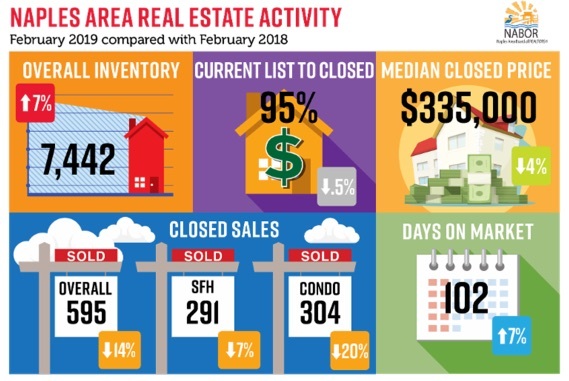 According to NABOR's monthly reports, January had 672 closed sales, February reported 672 closed sales, but March kept agents very busy with 942 closed sales, driven by a strong high end which included a number of new construction condominiums just delivered. 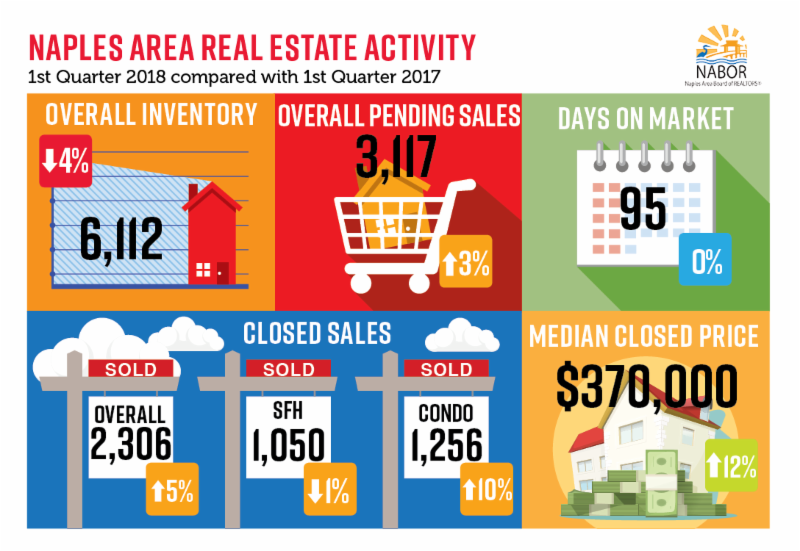 Pending sales in the first quarter of 2018 increased 3 percent to 3,177 compared to 3,097 in the first quarter of 2017. Although pending sales for both single-family homes and condominiums over $1 million increased by double digits, it was the $2 million and above condominium market that raised eyebrows among brokers who reviewed the reports. "Tourism was up in our area this season compared to last year so it is not surprising that we would end with strong pending sales for the quarter," said K. Zorn. "But I wasn't expecting to see a 109 percent increase during the quarter in pending sales for condominiums over $2 million!" "There are very good investment opportunities in the condominium market, especially at both ends of the market," added C. Amar. "The top and bottom price categories are where both the inventory has grown and the prices have dropped." As reflected in the market's year-ending statistics (12-months ending 1Q 2018 versus 12-months ending 1Q 2017), there was a 69 percent increase in closed sales of condominiums in the $2 million and above market, and a 17 percent decrease in its median closed price to $2,450,000 from $2,962,000 in 2017. Despite rocket sales in this high-end sector during the first quarter of 2018 (179 percent increase) and a drop in median closed prices for the first quarter (24 percent decrease), its inventory increased 5 percent! Similarly, median closed prices for condominiums in the $300,000 and below price category dropped 1 percent to $199,000 from $200,000 in the first quarter of 2017, but inventory increased 3 percent. Broker experts analyzing the reports said most counties in Florida continue to see inventories decline, but the Naples area experienced a steady rise over the past few months. In fact, according to J.Jones, there is currently 8.25 months of inventory available in Collier County. Months of inventory is a nationally accepted measurement of how fast all existing homes on the market would last assuming no additional listings are added and sales activity continues to remain the same as the previous 12 months of sales. "There were 118 closed sales of condominiums between $1.4 million and just over $2 million in a new development located in North Naples during the last two months that impacted our median closed price statistics," said W. Kunkle. These "one-day-on-the-market" closed sales are one reason why the report showed a 13 percent increase in the median closed price for condominiums in the $1 to $2 million price category and a 24 percent decrease in median closed prices for condominiums in the $2 million and above price category. Kunkle, along with several brokers who reviewed the reports, is concerned sellers may misinterpret this statistical anomaly as a reflection of the area's comparable pricing activity. "These sales were for new luxury condos that were secured over a two year period. When the project obtained its final Certificate of Occupancy, the closings were finalized and they all appeared as a one-day sale in the MLS." However, this was not the only new construction activity that influenced NABOR®'s first quarter statistics. According to Jones, many sellers of speculative single-family homes that have been on the market for over two years in neighborhoods like Park Shore and the Moorings began to set more realistic list prices this past quarter, which resulted in more sales in the high-end, single-family home market. "Overpriced homes don't sell," said Jones. "In fact, I think sales during January and February could have been better had many of these sellers set their prices realistically earlier. It wasn't until March that I began to see an uptick in price decreases in the MLS for many of these speculative homes, and then those sellers saw multiple offers from buyers who had been holding out." If you are looking to sell a home in Naples, contact a REALTOR® who has the experience and knowledge to provide an accurate market comparison so you can determine the right asking price. A REALTOR® can also ensure your next purchase in the Naples area is a success. Find our more at Naplesarea.com. Naples, Fla. - Home sales increased 4 percent in 2017 and the median closed price increased 3 percent, according to the Year End 2017 Market Report released by the Naples Area Board of REALTORS® (NABOR®), which tracks home listings and sales within Collier County (excluding Marco Island). The report also showed heightened activity in the high-end market, with closed sales of homes in the $2 million and above price category skyrocketing 20 percent in 2017. "Real estate sales are based on many other economic factors," said T. Bringardner, Jr,. "In 2017, we saw above average employment rates, low inflation, record stock market activity, and increased consumer confidence. Looking into 2018, there are additional reasons for buyers to be optimistic including new tax cuts on the horizon and continued growth of their investment portfolios." A. Vellano, agrees with Bringardner and also points to the unusually frigid weather in northern states recently, which he says will encourage more people to head south and buy homes. "Now is a great time to diversify and invest in property because there's still plenty of inventory and prices have remained stable." This may not always be the case as indicated by C. Carroll, SRA of Carroll & Carroll Appraisers and Consultants LLC, who advises real estate agents to start watching closely for pockets that may soon show an increase in value. "Overall we had a solid year, but there are hints that change is coming with opportunities for increasing values in market sectors with tightening inventories." According to Vellano, pending sales during the 3rd Quarter increased 5 percent (12-months ending August 2017), while pending sales at the end of the 4th Quarter increased 2 percent (12-months ending December 31, 2017). "We can only imagine how much more activity the statistics would reflect if the market had not been shut down for nearly five weeks because of a major hurricane in 2017." 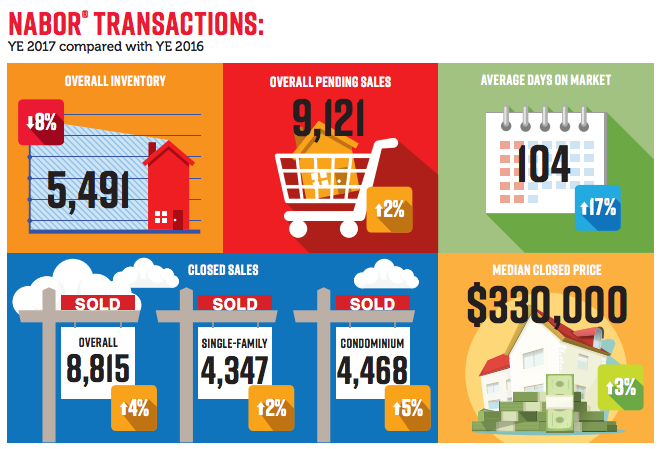 The year-end report showed a 4 percent increase in closed sales to 8,815 in 2017 compared to 8,510 in 2016. Many brokers, including B. Huskey, think, "4 percent growth is great considering we had a hurricane and we lost over a month of real estate activity." "Between December of 2015 and December of 2016, overall market inventory increased 54 percent; between December of 2016 and December of 2017 overall inventory has decreased 11 percent. The single family and condominium markets are well positioned with about 7.5 months of supply in each," said Carroll. "Other areas in Florida, like Tampa Bay, have less than 2 months worth of inventory," said Vellano. Properties priced below $300,000 experienced the fewest days on market in 2017. Some broker analysts reported that they saw many of these properties go from list to close in less than 10 days. Inventory continued to struggle in the low end of the market making options difficult for buyers looking for single-family homes in this price range. In fact, 1,265 of the 1,554 available properties in the $300,000 and below price category were condominiums. "The shining star in 2017 was condominiums in the $1 to $2 million price category," said B.Fioretti. "This category had a 28 percent increase in pending sales and a 14 percent increase in closed sales." Geographically, condominiums in North Naples were the biggest sellers in 2017. Closed sales in this region increased 17 percent, while pending sales increased 15 percent. How homes are purchased continued to shift in 2017 with an increase in conventional sales (properties with a mortgage). According to M. Hughes, "Only 54 percent of home sales in Naples were cash buys in 2017 compared to 69 percent in 2013. Many factors play into this trend including the fact that we have more end users and fewer investors. Also, a buyer's ability to lock in a low interest rate allows them to continue to enjoy the high performing stock market, which had a 25 percent increase in 2017." Naples, Fla. - The Naples area housing market maintained positive traction during the Third Quarter of 2017 despite enduring a hurricane that impeded activity for three weeks in September. According to the September 2017 Market Report released by the Naples Area Board of REALTORS® (NABOR®), which track home listings and sales within Collier County (excluding Marco Island), there were 398 closed sales during the month of September, a 30 percent decrease compared to September 2016. "To withstand a hurricane and still outperform last year's activity is a clear sign of market resilience," said B. Huskey. Broker analysts who reviewed both reports agreed that our county's hurricane building code standards and quality craftsmanship by local builders helped to greatly reduce the amount of major structural damage in the area. "The hurricane hit us in the right month," said M. Hughes, VP for Downing-Frye Realty, Inc., who went on to explain that September is typically when the housing market takes a breath before it begins to intensify again. Yet despite a direct hit by a major hurricane, overall closed sales for the third quarter increased 3 percent (year over year). Not surprisingly, the storm's short-term impact on the housing market in September only tempered sales slightly in the third quarter by 5 percent (quarter over quarter), which translated to just 86 fewer closed sales than in the third quarter of 2016. "A 55 percent decrease in pending sales for September is equivalent to three weeks of inactivity," said C. Amar. "These sales didn't disappear, they are just delayed. The hurricane's force slowed inventory in September, which resulted in a third quarter decrease of 9 percent. J. Jones, said this was most likely a result of homeowners either delaying to list because they evacuated or removing a listing because they needed time to clean up and make minor repairs to properties following the storm. "The hurricane created big concerns and delays from banks too," said Jones. "Most lenders are requiring re-inspections and re-appraisals of properties after the hurricane. "One element the hurricane failed to harm was the continued growth in property value for Naples. Overall median closed prices in the third quarter of 2017 increased 3 percent to $320,000 compared to $312,000 in the third quarter of 2016. "The integrity of our real estate market has been renewed now that it survived a direct hit from a major storm like Hurricane Irma," said L. Melo, adding, "Even homes built over 50 years ago withstood damage. Our survival actually strengthened buyer confidence." "Fortunately, media in most of the core areas where our buyers come from didn't overhype the storm, which helped obscure fears," said C. Carroll, a real estate appraiser. "This is going to be a very good history lesson for us because the hurricane hit during a time of stable market activity. By January though, I think our brush with Irma will be forgotten. "Carroll added that sales of existing homes are poised to increase in the coming months too because much of the labor force stepped away from new construction to work for companies that provide a variety of property maintenance, including tree removal and lawn debris cleanup. W Kunkel, added that material costs for new construction may increase too as there will be shortages across the country due to the hurricanes and fires. Carroll responded that delays in new home construction might spur increases in existing home values, especially if inventory does not keep up with the pace of sales. Compared to other tropical second-home destinations like Puerto Rico, the Southwest Florida housing market fared quite well after it faced a hurricane. Broker analysts including Hughes and Kunkel believe our area may see an uptick in sales from buyers who had their eyes set on an island home in the Caribbean. Naples, Fla. - Record-breaking rain fall in June did not dampen buyer interest in the Naples housing market as evidenced in the Second Quarter and June 2017 Market Reports released by the Naples Area Board of REALTORS® (NABOR®), which track home listings and sales within Collier County (excluding Marco Island). The 2Q report showed strong and steady sales activity leading into summer with a 7 percent increase in overall closed sales to 2,880 closed sales in 2Q 2017 from 2,704 closed sales in 2Q 2016, and a 9 percent increase in overall closed sales for the month of June to 907 closed sales from 832 closed sales in June 2016. There were many remarkable areas of activity in the 2Q Market Report. For example, condominiums in the $2 million and above price category saw an 86 percent increase in closed sales and a 38 percent decrease in median closed price in 2Q 2017 from 2Q 2016. Similarly, pending sales (homes under contract) in the North Naples market increased 20 percent during 2Q 2017 from 2Q 2016, and was the only geographic area that reported a decrease in median closed price (-1 percent). As reflected in the 2Q Market Report, pending sales of condominiums in North Naples increased 30 percent to 428 condominiums in 2Q 2017 from 329 condominiums in 2Q 2016. Closed sales of condominiums in North Naples increased 29 percent to 463 condominiums in 2Q 2017 from 358 condominiums in 2Q 2016. Condominium sales moving into summer look very good for North Naples too as June's Market Report showed a 30 percent increase in pending sales. Overall inventory during the 2Q of 2017 rose a respectable 4 percent to 5,189 homes in 2Q 2017 from 4,983 homes in 2Q 2016. According to B.Coffey of Amerivest Realty Naples, inventory during the 2Q was "getting eaten up by sales." This is very evident in the Report for homes in the $2 million and above price category, which only saw a 1 percent increase in inventory, yet a 43 percent increase in closed sales. Despite a 12 percent increase in inventory for the $300,000 and below price category, there was a 4 percent decline in overall closed sales in this low-end price category. Interestingly, while inventory for condominiums in the $300,000 and below price category saw the highest increase (17 percent) in the 2Q of 2017, the number of closed sales for condominiums in this category did not change quarter over quarter. "Buyers struggling to find homes under $300,000 in the single family market are turning to condominiums or coach homes as an alternative," said S. Barker of Equity Realty. "Even so, as it stands today, there is only 2.4 months worth of inventory available in the under $300,000 single-family home market, and 4.2 months worth of inventory available in the under $300,000 condominium market." In response, many broker analysts remarked that slack sales in the low end of the market might be due to the imminent burden of additional costs beyond the sale price such as high condominium association and/or club membership fees. Closed sales in the $2 million and above price category are poised to remain strong through the summer as this category experienced a 30 percent increase in pending sales during the 2Q of 2017. One explanation for the burst in closed sales activity for the $2 million and above condominium market was given by Amar, "It appears sellers in the high end of the market are coming around to the idea that a realistic price will sell a property faster. The 38 percent reduction in median closed price for this category during the second quarter shows we are not only seeing more negotiations, but also that sellers are more willing to accept real market offers." Broker analysts reviewing the June 2017 Market Report acknowledged that the first two weeks of June started out a little slow, but the month ended strong with 907 closed sales, up 9 percent from 832 in June 2016. Sales of condominiums on the Naples Beach took center stage in June with a 50 percent increase over June 2016. June's pending sales activity may set the tempo for a promising summer, as pending sales increased 16 percent in June 2017 from June 2016. At the end of June 2017, the Naples market contained 7.86 months of inventory, which is considered to be normal, indicating that the June market is neither a sellers' nor a buyers' market. Inventory has not been this robust for the month of June since 2011. Mike Hughes, General Manager for Downing-Frye Realty, Inc., remarked that the Days on Market increase of 18 percent could be due to overpriced listings. 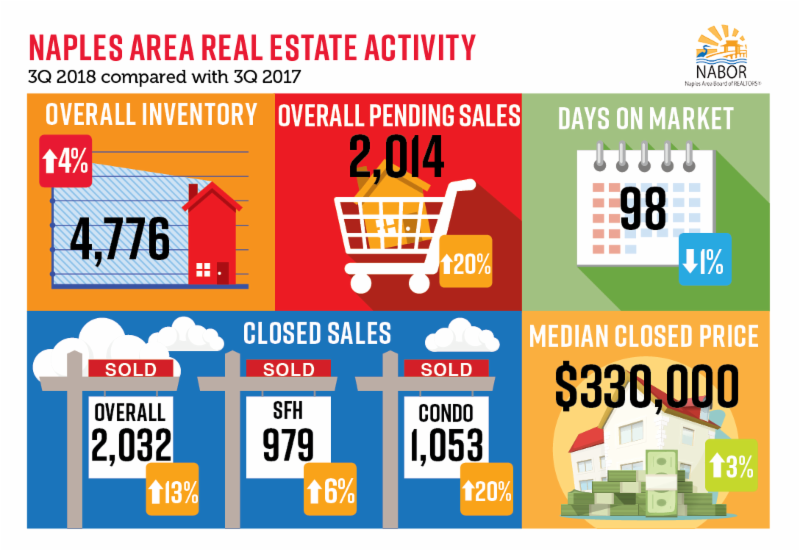 Naples, Fla. - Overall closed sales of homes in May shined brighter than any other month previously reported in 2017, with an impressive 23 percent increase to 1,027 closed sales in May 2017 from 838 closed sales in May 2016. Likewise, overall pending sales (homes under contract) also outperformed activity reported in the last four months. Leading broker analysts who reviewed the May 2017 Market Report released by the Naples Area Board of REALTORS® (NABOR®), which tracks home listings and sales within Collier County (excluding Marco Island), are quite confident that real estate agents will be very busy this summer. "If May's momentum continues, this year will turn out better than last year," said Mike Hughes, Vice President for Downing-Frye Realty, Inc. "Home sales during the summer months have become stronger over the past few years. We are no longer seeing a huge disparity in activity between winter and summer like we once did." "This type of behavior is short sighted," said Hughes. "Those who let a listing expire at the end of our winter season are missing a huge opportunity to sell their property during the summer months." Hughes added that our area attracts a variety of buyers during the summer such as international travelers, families from Northern states, and those relocating from other parts of Florida. Comparatively, the overall median closed price decreased 8 percent in January, while the May report showed an increase of 5 percent to $355,000 in May 2017 from $338,000 in May 2016. Incidentally, January's median closed price was $314,000. If the logic behind removing a listing at the end of season is based on old beliefs that a property will obtain a higher sale price during the winter months, then sellers need to examine the May statistics more closely. According to NABOR reports, there were 424 more closed sales during May than January. "Buyers during the summer are more serious," said Wes Kunkle, President and Managing Broker at Kunkle International Realty. "In season, we get a lot of traffic, but it's mostly lookers. In the summer, people are ready to buy. They ask real buyer questions, and most often have financing in place." The May report also showed overall inventory increased 4 percent to 5,404 homes in May 2017 from 5,207 homes in May 2016. Homes in the $300,000 and below price category had the highest inventory increase of all other price categories, reporting a 12 percent increase to 1,551 properties in May 2017 from 1,391 properties in May 2016. While still an increase over last year, the rate of the market's overall inventory increase is tempering. In fact, brokers are concerned that housing options in some geographic areas, such as in the Central Naples single family market, may start to pinch sales as this area experienced a 50 percent increase in single-family closed sales during May, but had only an 8 percent decrease in inventory. According to Kathy Zorn, broker/owner of Better Homes and Gardens Real Estate Pristine, "Buyers who are looking for a condominium in the Naples Beach or North Naples area this summer may encounter some challenges as these areas are running low on inventory." Zorn pointed out that in North Naples there was a 47 percent increase in closed sales of condominiums during May, a 26 percent increase in pending sales of condominiums during May, and only a 9 percent increase in inventory. The situation is even more alarming on the beach, as both pending and closed sales of condominiums increased by double digits, but its inventory rose only 1 percent in May. As a highly desirable second-home location that rarely falls below 70 degrees, Naples will always increase in population during the winter months and then decrease during the summer. But according to county growth reports, the permanent residential population in Naples is also growing steadily. When asked, several brokers say that a large majority of the next season's part-time residents, along with a host of new permanent transplants, prefer to do their home buying during the summer.